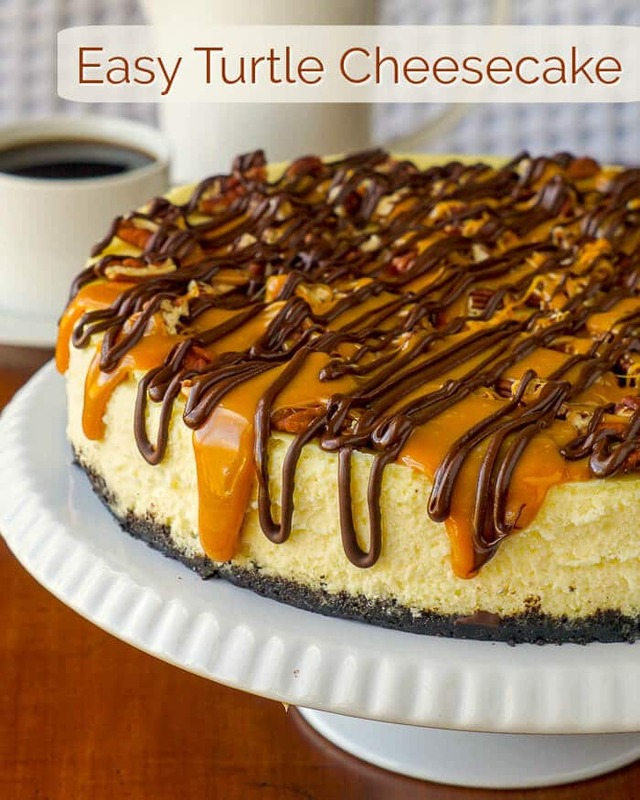 Turtle Cheesecake- pure decadence in a very easy to make recipe! Turtle Cheesecake. An easy to prepare, creamy vanilla cheesecake sits on a chocolate cookie crumb base and is topped with toasted pecans, gooey caramel and chocolate; perhaps our most decadent cheesecake yet. 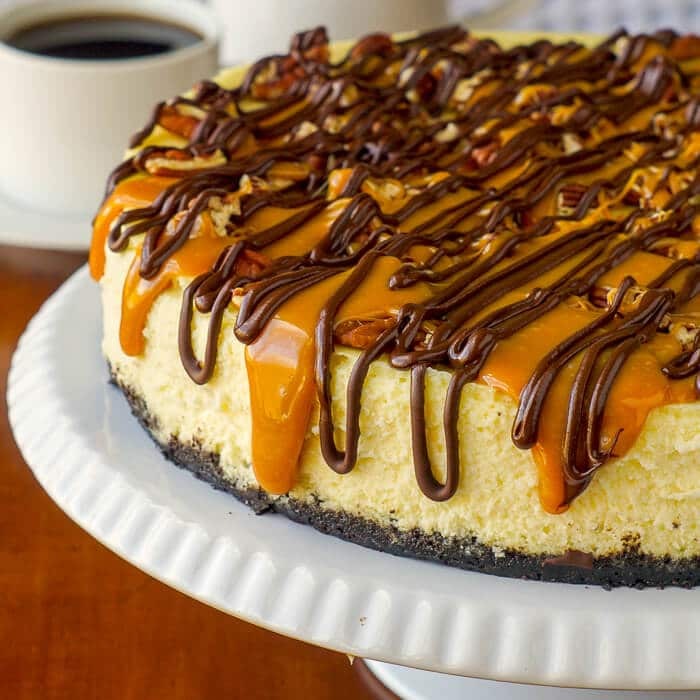 When a regular reader of ours, who wanted a decadent Turtle Cheesecake to serve at her upcoming Thanksgiving dinner, asked me to post a recipe, I was hesitant because there is no shortage of them online. I was flattered by her response when I asked why she wanted one posted here. While I was surprised and flattered by that, it did make me reflect a lot on the last 10 years of writing Rock Recipes. With over 1600 recipes on this website now, it has become a trusted database for many of our loyal readers. You need only to read the responses to posts over on our Facebook Page to see that is quite true. I consider it a great compliment that folks trust my tried and true recipe style and my advice when it comes to cooking and baking. Rock Recipes has grown a lot over the last 10 years. In my first day online back in 2007, I think there were 86 page views on this website, yesterday set a new record with just under 60,000 and the last 30 days have seen over 1 million page views. So yes, Susan, the loyal reader I mentioned above, I am posting this just for you… well, for all of you who have been part of making this blog such a success over the years. Another loyal reader loves the idea of mini cheesecakes, like our Chocolate Cheesecake Cupcakes or our Mini Coconut Cream Cheesecakes, and a few others to be found here. I have already set to breaking this recipe down into a mini cheesecake version and will post that very soon as well. 2019 UPDATE! It took me long enough but the mini cheesecake version of this recipe is now posted. 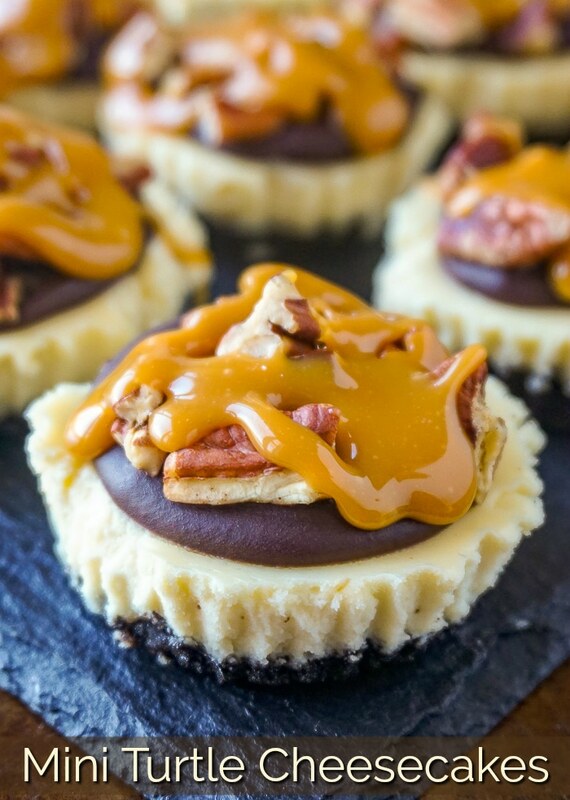 Find my recipe for Mini Turtle Cheesecakes here. If you’d like to use the bain marie method of baking this cheesecake, take a look at this recipe for Just a Vanilla Cheesecake. 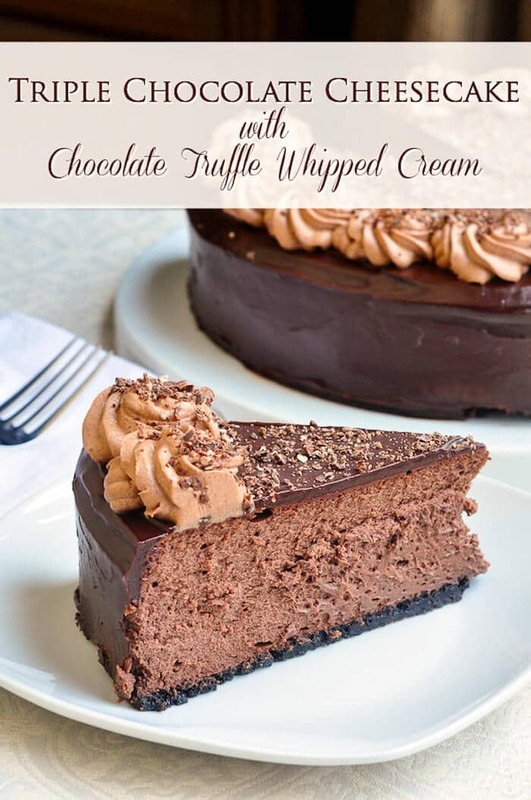 If you liked this recipe you may also want to try our Triple Chocolate Cheesecake! 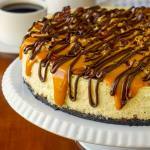 Like this Turtle Cheesecake recipe? 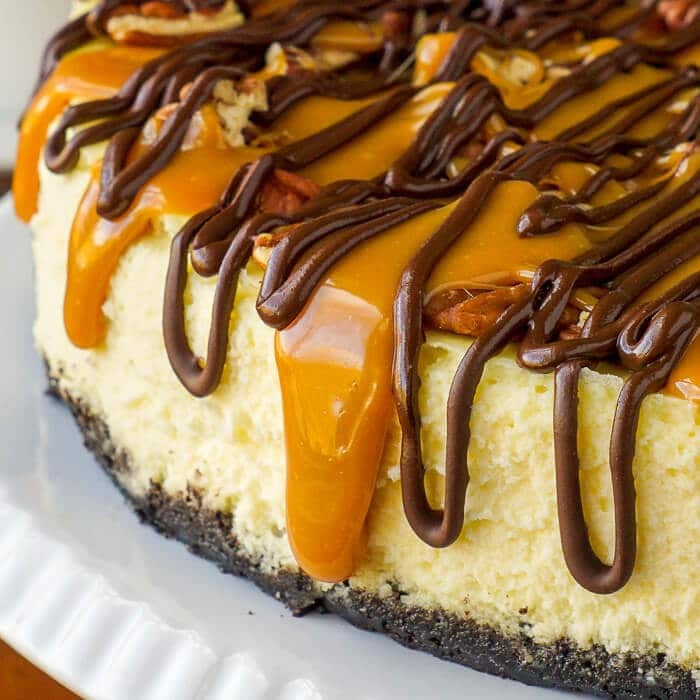 Turtle Cheesecake - a creamy vanilla cheesecake sits on a chocolate cookie crumb base and is topped with toasted pecans, gooey caramel and chocolate; perhaps our most decadent cheesecake yet. In a small bowl, combine the cookie crumbs, sugar and butter. Alternatively you can line the bottom of the pan with parchment paper which will help to release the cheesecake from the pan. Add the eggs , one at a time beating well after each addition. Pour over the prepared base and bake in at 325 degrees F for 60 minutes to 70. The cheesecake should just be beginning to lightly brown at the edges (although it need not brown at all to be done) and the surface of the cheesecake should lose any shine when the cake is properly baked. It can still be slightly wobbly just at the centre at this point. Remove the cake from the oven and run a sharp knife completely around the edge of the pan. This will allow for the cheesecake to shrink as it cools and hopefully not crack (but who cares if it does? I am never bothered by a crack or two in the surface) Allow the cheesecake to cool thoroughly on a wire rack at room temperature. (NOT in the fridge). When at room temperature refrigerate for several hours or overnight. Toast the pecans in a single layer on a cookie sheet in a 350 degree oven for 8-10 minutes. tossing them halfway through that time. Spread the pecans evenly over the surface of the cheesecake and press down sightly so they get good contact. Add the caramel candies and whipping cream to a small saucepan and melt gently over low heat. Melt the chocolate chips in a double boiler and drizzle the chocolate over the caramel and pecans. Cool for an hour before serving. Thanks for this one Barry. I just made my shopping list and I am off to get the ingredients. I have made many of your recipes, and I must say, I look here first, especially for anything Newfie, and so much more. I’m a Roxie from Rabbittown, and proud of it. Growing up there was a small fish store on the corner of Aldershot and Merrymeeting. My mom would send me off with a newspaper to get a 25 cent fish and a bag of tongues. I could barely carry it home. Needless to say, we ate lots of Newfie dishes..Fish and brewis with scruncheons had to be my favourite. Good luck, Merry Xmas and all that. I know there will be many more great recipes to come from your kitchen. Small world, that was my Great Uncles fish shop. Badcock’s Fish Market. His brother Archie started Archies Snacks on the corner of Cashin Ave and St. Clare Ave.
Their sister, my Nan Parsons, married in Bay Robert’s where I am from. So glad you are enjoying the recipes! Have a great Holiday season, Barry. Hi Barry, I was wondering about the whipping cream for the turtle cheesecake, did you whip it first or add just from the carton. Thank you, Judy. Nope, just pour it in. Hi, I’m making this today, I just took out my whipped cream and it’s curdled 🤔 Best before march 12th…. so I wanted o know if there was anything else I could use and how much? Sorry, only whipping cream will do for this recipe. Question … did I miss instructions sonewhere to bake the cookie crust layer before adding filling? The crust was googy and didnt stick to the filling nor lift out of the pan. Can I ask if you used real butter? I’ve never had a report of that happening. I’m suspecting a butter substitute? Yup, very important to use soft caramels. Other caramels will harden far too much. cooled where hard as rock! They need to be very gently heated. Add a little more milk if you like but if it gets too hot they will harden.That’s the nature of sugar. Hello Barry going too try it again with SOFT CARAMEL! Do you have any other recipe for the chocolate drizzle that’s as easy as the caramel? I always seem to have a hard time with something as easy as DRIZZLING!! LOL! Muchas gracias por todas tus maravillosas recetas y por lo fácil que son de entender gracias a tu forma de explicarlas. I was wondering if the color of the springform would change the baking temp? And also should I bake the crust first for 10 minutes then reduce the cheesecake time to 50min? No changes necessary. I never pre-bake crusts for cheesecake. Yes but the toppings should be added after it is thawed. When do we remove it from the pan? Before of after it goes in the fridge? When do we add the toppings? After it is in the fridge for a few hours? After cooling in the fridge. Toppings go on after the fridge chilling. Can this recipe be made as individual cups? Same comment as Colleen. I would suggest baking the crust @325 degrees for 10 minutes. Crust fell apart when removing to cake plate. And I used 100% butter. I’ve never ever had an issue with the crust. Did you use parchment paper on the bottom? regular milk been added to thin the caramel? You let the caramels get too hot and they went past soft ball stage. (in candy making terms) Lower and slower is what you need. A little more milk will help too.